The story of a man who lost his faith, but found much, much more. Growing up in a strict Muslim community in south-east London, Alom Shaha learnt that religion was not to be questioned. Reciting the Qur’an without understanding what it meant was simply a part of life; so, too, was obeying the imam and enduring beatings when he failed to attend the local mosque. But Alom was more drawn to science and its power to illuminate. As a teen, he lived between two worlds: the home controlled by his authoritarian father, and a school alive with books and ideas. In a charming blend of memoir, philosophy and science, Alom explores the questions about faith and the afterlife that we all ponder. This is a book for anyone who wonders what they should believe and how they should live. It’s for those who may need the facts and the ideas, as well as the courage, to break free from inherited beliefs. In this powerful narrative, Alom shows that it is possible to live a compassionate, fulfilling and meaningful life without God. He is gentle and persuasive – the type of teacher you would have loved to have had educate you. A book that destroys the cliche of the atheist as joyless rationalist and shows the humanity, love, and concern that often lies behind godless thinking. More than just a great handbook, this is an honest and often very moving story about valuing truth over hope, even in the face of grief. Illuminates the route to a better destination for all those who seek what Alom found, namely, that precious liberty of mind which makes its possessor open to all good things. 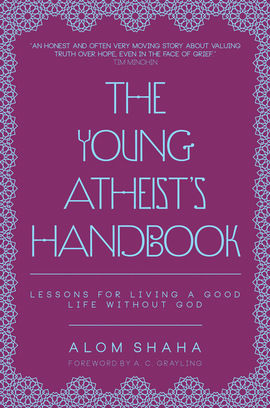 The Young Atheist’s Handbook [is] an inspiring read for anyone. It’s one of very few atheist books I’d feel comfortable recommending to a wide audience of believers and non-believers alike. A very brave book... I really enjoyed reading about his personal journey... [There are] really important questions raised for anyone of any faith. Those who want clear arguments about the impossibility of belief, as well as those who enjoy a well told and illuminating memoir, will all be pleased with this book.